Musician Valerie Troutt in West Oakland. West Oakland Youth Center's "Friday Night Live"
Usually on a Friday night in West Oakland you don't see the sights of children playing outside, basketball with adults, kids dancing to the sounds of a DJ spinning music from their mother's era, chess games set out on tables in the middle of the street, and kids cooking for a line of aunties waiting for BBQ. "We want this to be the normal", said District 3 City Council member Lynette Gibson McElhaney. 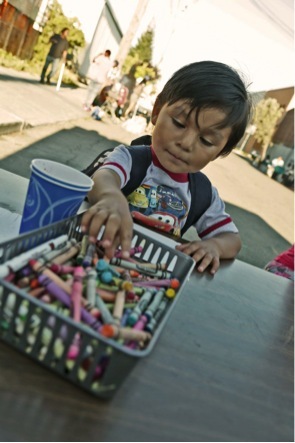 West Oakland Youth Center kicked off "Friday Night Live," a block party thrown in the summer through different neighborhoods of Oakland, right on their block. 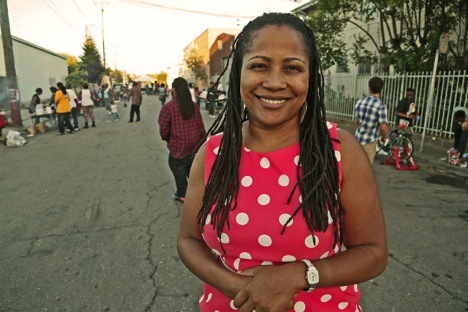 A long time West Oakland resident herself, Lynette had fought to keep "Friday Night Live" around for the community after it had come to a halt due to funding issues last year. 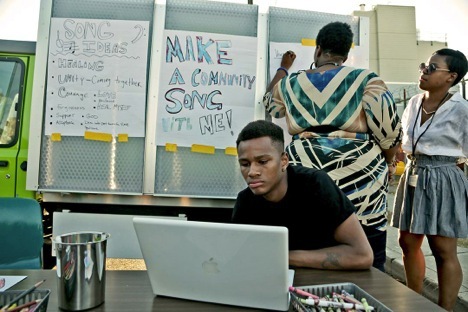 Singing through its return was Oakland Jazz and Soul musician, singer, and teacher "extraordinare" Valerie Troutt, who, along with the OMCA Connect team ran workshops with youth about music and building song together. While folks sat down to design their album covers for the musician in them, Valerie went up and down the block collecting lyrics for a song. The lyrics: words from a son coloring with his mother, words from the domino table, words from the kids running the bicycle juicer. Everyone adding a sentence, a word, a theme to the song. A song that is well needed in the community of West Oakland. "People, Place, and Love Connection. Sometimes we don't feel love. But what binds us together is love of place. When people are from Oakland you love the town and you share a comradery with people even if you don't know them. So when I think about this space, I really do think about how do we stimulate this as an ongoing basis. And that this is the normal, kids playing in street, being safe, listening to music and being positive. That's what we aspire to. We're standing against the things that are abnormal like the acts of violence and self destruction."